From the South: Take I-95 to Rt. 301 exit 82 (Chamberlayne Ave.). Take left on Rt. 301 North to Wilkinson Rd. (1st traffic light). Turn right onto Wilkinson Rd. and go approximately one mile (pass ball fields on your left) and turn left onto Old Sellars Way (You will see the sign for Wilder Middle School). Go one block and take the first right for parking. PARKING: Please Park in the parking lot at the end of Field 1 or continue around past the tennis courts and park in the Wilder Middle School lot. DO NOT PARK on the house-side of Old Sellars Way or on the neighborhood streets. You are allowed to park field side on Old Sellars Way, please pull in at angle to park. From the North: Take I-295 south to the Rt. 301 South exit (Chamberlayne Ave.) and go south for about 2 miles. Take a left on Wilkinson Rd. Go approximately one mile (pass the ball fields on your left) and turn left onto Old Sellars Way (You will see the sign for Wilder Middle School). Go one block and take the first right for parking. 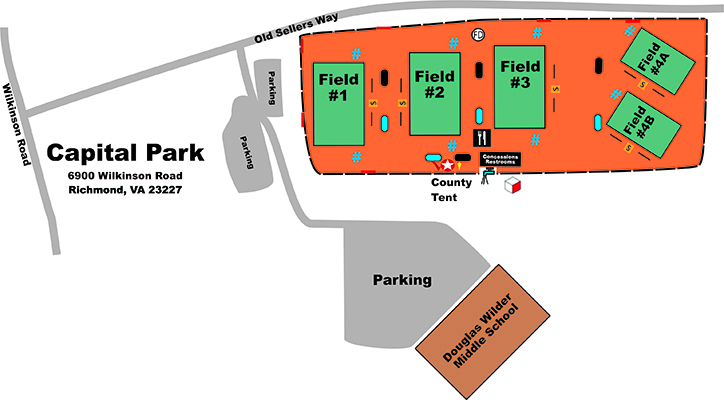 PARKING: Please Park in the parking lot at the end of Field 1 or continue around past the tennis courts and park in the Wilder Middle School lot.